Best Wishes video booths. Technical specifications. 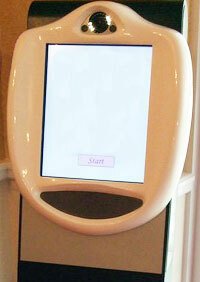 The Bestwishes video booth uses a high resolution video camera to digitally capture recordings directly to a hard drive. Unlike many systems, we do not use a lower spec webcam which would result in lower quality video capture. The recordings are then digitally mastered to DVD with zero loss in quality. Camera: PAL 720 x 576 @ 25 frames per second. Video Format: Full quality: AVI, MPEG. Lighting: Internal LED lighting system. Video Storage: 730GB (Approx 60 hrs). Audio: Internal microphone powered single speaker output. Touch Screen: 19” Portrait LCD touch screen featuring IntelliTouch surface wave.